-Jeremy Narby Bio - ARTE AMAZONIA provides a global voice through art for the indigenous cultures of the Amazon. and biospheric television, NY April 12, 2008. Jeremy is a leading author and investigator of intelligence in nature and the traditional knowledge systems of indigenous Amazonian peoples. A Switzerland-based anthropologist, activist and author, he has been working since 1989 for the NGO Nouvelle Planète, backing initiatives by and for the indigenous peoples of Amazonia, including land titling, bilingual education, sustainable resource use, preservation of plant knowledge and environmental monitoring of petroleum companies. He is the author of several important books about shamanic and western/scientific knowledge systems, including Intelligence In Nature and The Cosmic Serpent, as well as the collection of translated essays, Shamans Through Time (co-edited with Francis Huxley). In addition, he is a dynamic and effective speaker who has held several online seminars including EVOLVER INTENSIVES and has made talks around the world. 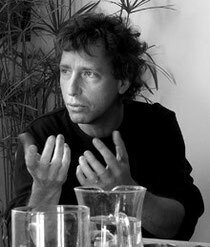 His interests in Ayahuasca as a utility in gaining knowledge has inspired him to sponsor expeditions to the rainforest for biologists, and other scientists, to examine indigenous knowledge systems. Since 1989, Narby has been working as the Amazonian project director for the Swiss NGO, Nouvelle Planète which is directed to supporting indigenous peoples and their lands. Click to read an interview with Jeremy Narby about his book the Cosmic Serpent. with Nouvelle Planète and perspectives on indigenous knowledge.